Your master bedroom should be a serene, beautiful place to relax and recharge. So why, then, is it often one of the last rooms in the home to be decorated? I think it's partly because there's so much we want out of a master bedroom, it can be hard to know where to start. 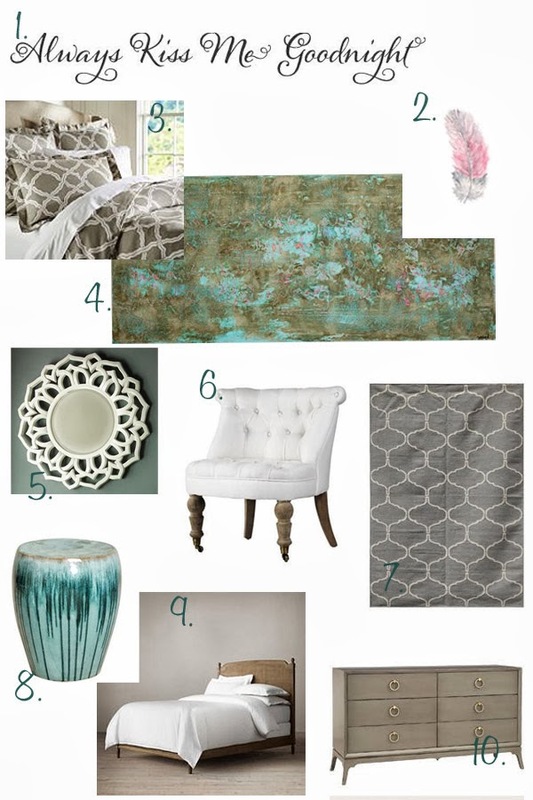 Today, we're sharing a beautiful, refined, and elegant master bedroom mood board to inspire your own bedroom design! 1. This WallQuote™, shown in a beautiful script font, would be perfect over a bed. How about pairing it with a couple of sconces or a trio of decorative mirrors? Any way you display it, this is the perfect starting point for our mood board. 2. Adding a simple piece of art, like this Watercolor Feather Painting, is a great way to add a subtle pop of color to this space. 3. This bedding set, in a beautiful trellis pattern, adds a modern touch with it's bold geometric pattern. 4. This large abstract painting would be perfect over the dresser or in a sitting area. It's fresh and modern, with a lovely color palette of blues, grays, browns, and pink. 5. This striking mirror is bold yet simple, unique but classic. It's simply lovely! 6. Oh my, what's not to love about this elegant, tufted linen chair? This gorgeous piece would be perfect for everything from reading, to enjoying your morning coffee (or tea!) to having a conversation. 7. This gray area rug from RugStudio not only cozies up the space, but also adds another textural element to the room. Love the classic, yet updated, motif! 8. In shades of teal and aqua, this garden stool is a fun alternative to a nightstand. I love the paint-dripped effect! 9. What is there to say about this gorgeous, sumptuous wood bed other than "Please come live with me in my home?" So much to love about this piece! 10. I adore the round pulls on this elegant dresser from Layla Grayce. It's the perfect complement, both in color and style, to this lovely room! So there you have it! Tell me-what's your favorite part of this space?